Dr. Daniel Zanotti at the Center for Orthopedics in Sheffield Village, Ohio, just west of Cleveland, now offers all-arthroscopic ACL reconstruction. With this minimally invasive knee surgery, most of the pain and swelling subsides in 4-6 weeks, vs. 3-4 months for traditional ACL reconstruction. "This time of year, athletes have a lot of knee injuries, especially football and soccer players," says board-certified orthopedic surgeon Daniel Zanotti, MD. "At the Center for Orthopedics, we're pushing the envelope with a brand-new all-arthroscopic ACL reconstruction procedure." "This minimally invasive 'Band-Aid' surgery results in less pain, swelling and inflammation than traditional ACL reconstruction, so patients' rehab can progress much more quickly," notes Dr. Zanotti, who is fellowship-trained in sports medicine and arthroscopy. "Most of the pain and swelling subsides in 4-6 weeks, vs. 3-4 months for traditional open or partial-arthroscopic ACL replacement," Dr. Zanotti notes. The ACL, or anterior cruciate ligament, is one of the four major ligaments in the human knee. ACL injury is the most common knee injury, especially in athletes. Broadview Hts., Ohio wrestling coach Dennis Balogh is ready for the new season--complete with a new ACL--thanks to all-arthroscopic ACL reconstruction. Balogh, 34, tore the ACL in his left knee last spring. "I was training kids, doing extra workouts," he recalls. "When I was wrestling full-go with one of the 189-pounders, he took his shot and my foot got caught in the mat. I heard a loud 'pop' and then felt a lot of pain." When Balogh was diagnosed with a complete ACL tear, he knew surgery was in store. "I didn't want to have to go through with it," he recalls. "I wanted to continue doing what I do--run, coach, play softball, stay active." 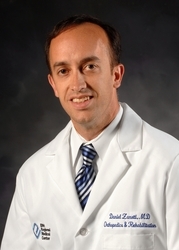 Balogh chose all-arthroscopic ACL reconstruction. "Once I heard that the recovery was quicker and the pain was less, I leaned toward the minimally invasive surgery," he says. "Traditionally, ACL reconstruction was done using the patient's own tendon tissue," Dr. Zanotti explains. "Orthopedic surgeons have recently started using allograft or donor tendon tissue. We've tried to eliminate any incisions for harvesting grafts or even for inserting them--doing everything arthroscopically through a few tiny holes." "The all-arthroscopic procedure was great," says Balogh. "A day out of surgery, the physical therapists were moving my leg. At no point in my rehab was there any concern that I was not going to get motion back. I shed my crutches in less than two weeks." "When I talked with a couple of college buddies who'd had ACL surgery back in the '90s, they couldn't believe how fast I was progressing," Balogh adds. "They kept saying, 'I can't believe you're doing this' and 'I can't believe you're doing that.' And I told them, 'Well, the procedure has changed.'" "Although patients can expect to have less pain and start rehab sooner after all-arthroscopic ACL replacement, it still takes six months to return to full normal activity," Dr. Zanotti notes. "The body needs that time to incorporate the new tissue and fully heal the ACL." To schedule a consultation with Dr. Daniel Zanotti or any of the board-certified orthopedic surgeons at Northeast Ohio's Center for Orthopedics, call 440.329.2800. The Center for Orthopedics, part of EMH Regional Healthcare System, offers the most comprehensive bone and joint care in Cleveland's west side, western Cuyahoga County and Lorain County, Ohio. Complete orthopedic care is available from an expert team of five advance-trained, board-certified orthopedic surgeons at offices in Sheffield Village, Oberlin and Westlake, Ohio. Call 440.329.2800 or visit http://www.center4orthopedics.com.